Perceptions between you and your audience should be dynamic, captivating and responsive. In a cluttered world, differentiation always leads. We make visible differences by immersing creativity in everything we do. Welcome to KMS Marketing & Design, a boutique marketing and design company that creates influential brand and marketing strategies, and dynamic design and copywriting solutions using an integrated approach. With targeted business-to-business and consumer marketing, we create powerful, agile brand campaigns for small businesses that produce exciting, measurable results and open doors to opportunity. Constantly learning, constantly evolving, we've built many lasting, professional relationships with companies across many industries. With a commitment to providing seamless, high-quality service, we are here to make a noticeable difference in your brand image and marketing. We truly believe that in order to succeed in any business today, marketers must be innovative and welcome new technologies and evolving business trends using fresh ideas. First and foremost, we aspire to achieve a precise blend of creative flair and technical functionality as these are not mutually exclusive. This aptitude has transpired to become a clear differential of expression with interactive marketing. There is an "art" to coalesce technical mechanics and attractiveness for online marketing, and our savvy ability to visualize and flawlessly manage every detail sets us apart. By using a harmonized omni-channel approach, we deliver the fullest extent of today's most essential integrated, strategic marketing, design, website, social media and PR disciplines to help you get connected and stay connected. We invite you to experience our unique capabilities and create a dynamic brand image for your company! We created a new identity for Living Off Campus 101 with a new logo and naming services for its sub-brands, and brand architecture and design services for its marketing collateral. Bright modern marketing pieces brought this company to life. Its parent company offers online services for students living off campus and property owners, including Off Campus Housing Locators, which helps student find the right place to live, Off Campus Housing Review, where students can rate housing and My College Roommate, which allows students to find a roommate based upon personal preferences. Distinctive brightly colored icons distinguish each service within the brand architecture. We assisted authors with their marketing services, including book design, typesetting, public relations, marketing communications and website design. Good cover design comes from listening to a client's objectives and understanding the story line to provide the best representation possible in the cover artwork. We helped owner Valerie Hayes launch her resume writing company with a fresh, new logo and website. There's always a Plan B. Plan B allows you to partner with an industry expert who will collaborate with you to showcase your best skills and demonstrated achievements to prospective employers. Defining your professional objectives and achieving success is their top priority. They understand that career management and each phase of your job search can become overwhelming and stressful at times. By establishing targeted goals and developing an action plan, you will level the playing field and move forward in a competitive job market. We partnered with Dr. Ollie Goodlow to create a modern logo for her business using impactful font and fun illustration. 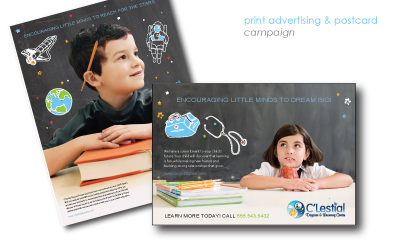 Dynamic marketing collateral helps to convey her clear message of mind, body wellness. She pioneered the first Mindfulness-Based Stress Reduction program in Landover Maryland at one of the largest health maintenance organizations in the country, Kaiser Permanente. Our featured client, Nabila K Cosmetics, is a lifestyle brand that offers beauty products by combining the finest elements and oils from natural world environments. Owner, Nabila Khashoggi's goal is to create an unforgettable bath time experience—relaxing and nourishing the body while clearing and invigorating the mind, and to create lifestyle products, such as candles and stationery with nature-themed design for your home. Since its inception, we've partnered with Nabila K to expand an extensive line of skincare and body products by creating modern, appealing label designs. Our work helps increase sales and market share worldwide and bring healthier lifestyles. Packaging, the most valuable consumer touchpoint, has influenced and transformed consumer behavior with creative, new trends and ideas for emotional reach. Nabila K's product ingredients delight the senses and its unique identity and packaging offers attractive photography that celebrates nature with modern design elements that make it memorable and appealing to consumers.